MINE is a documentary about the essential bond between humans and animals, set against the backdrop of one of the worst disasters in modern U.S. history. This gripping, character-driven story follows New Orleans residents as they attempt the daunting task of trying to reunite with their pets who have been adopted by families all over the country, and chronicles the custody battles that arise when two families love the same pet. Who determines the fate of the animals —and the people— involved? 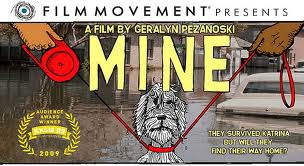 A compelling meditation on race, class and the power of compassion, MINE examines how we treat animals as an extension of how we view and treat each other. I went into this movie with some opinions. I have two dogs who I consider to be full members of my family - decisions on where we will live, how we will travel, where and for how long we will we go on vacation all take Seamus and Calvin into consideration. I said to myself, "If there was a hurricane, there is NO WAY I would ever leave my boys behind." I believe that if you make a commitment to an animal, then it's your responsibility to do everything in your power to uphold that commitment. After watching this movie, I'm more sympathetic to the survivors of Katrina. Hearing them tell their own stories, I better understand the terrible positions that many of them were put in. The film explains how most shelters - including the Super Dome - did not allow dogs and cats. How some people were forcibly removed from their homes because they would surely die otherwise. How one man had to evacuate 20 family members and there simply wasn't room for their beloved dog. In many cases, these people did do everything in their power to care for their animals. Tragically, the power they had was severely limited. Without giving away the resolutions of the people and pets the documentary follows, I will say this: if a person is trying that hard to find their dog, and if they've lost everything else in their life, then I hope that whoever adopted the animal would find it in their heart to return him or her to the original owner. I'm not saying that every single Katrina survivor deserved to have their animal back - for many of the abandoned dogs and cats, the hurricane really was the best thing that happened to them. It released them from negligent living conditions and gave them a chance for a new life. Then again, those negligent owners didn't appear to be the ones tirelessly searching for their dogs. Returning these pets should be considered on a case by case basis, and I think that MINE did a great job of objectively telling both sides of each story (including the politics and power plays that went into each struggle) and allowing the viewer to make up her own mind. Have you seen MINE? What did you think? One more thing: speaking of animals devastated by natural disasters, check out this Amazon registry created by the Joplin Humane Society. Joplin, Missouri was ravaged by tornadoes earlier this week and in addition to the many people who are suffering in the aftermath, there are many animals that also need help and assistance. If you purchase something from this registry (anything from dog food to flea and tick medication to cleaning supplies) it will be shipped directly to the shelter. For more information, check out this post by Brie Fit.